Working for a school, there never seems to be a budget large enough to cover the cost for new speech therapy materials. And let’s face it – kids get bored with doing the same old activity over and over. This is especially true for our articulation kiddos, since speech sound practice is often just drill-and-kill. This is why I wanted to share a creative, inexpensive, and novel way to make a therapeutic articulation activity for less than $3. It takes some preparation, but you can get a lot of mileage out of this one once you have created it. 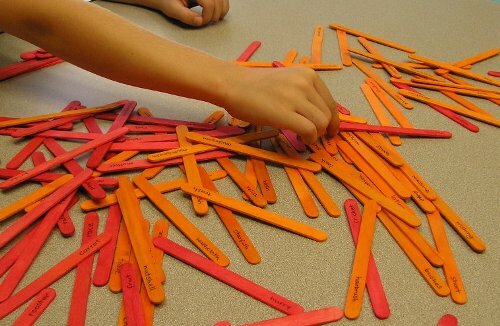 I am sure everyone is familiar with the game “Pick-up Sticks”, a game that tests visual and fine motor coordination. The rules are simple: a handful of sticks are scattered across the table, so that they cover each other. On their turn, a player carefully lifts and removes a stick without moving the sticks in the rest of the pile. Whoever has the most sticks at the end is the winner. 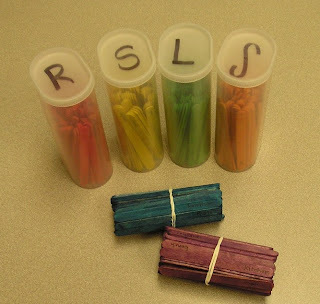 This game can easily be adapted for speech therapy using multicolored craft sticks. I got this idea from my master clinician (who incidentally is now my closest friend) when going through my school-based internship. 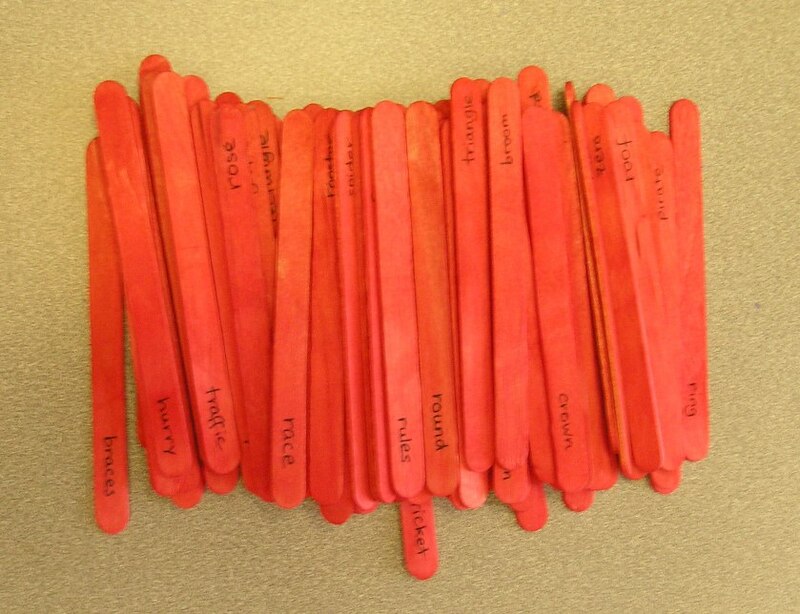 Sort the craft sticks by color and designate a specific sound for each color, for example /r/ for red, /s/ for yellow, etc. Next, write words from the word lists onto the craft sticks based on the colors you chose (e.g., write all the /r/ words on the red sticks). Repeat this process with different colors for a variety of articulation sounds. When you are done, you can store the sticks in a crystal light container. You now have an articulation pick up stick game! To play, you just dump the sticks onto the table and have students pick them up when it is their turn. After they choose a stick, they have to practice the target word x number of times (I make them practice even if the pile moves and they have to return the stick). 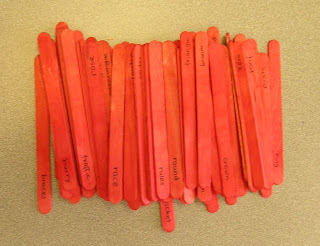 You can also just use the sticks as word practice (instead of artic cards). Just have the student pull a random stick from the container and have them practice. Cheap and easy, just the way school-based SLPs like it!